Your kids will LOVE you for it! Put on your chef’s hat! It’s time to get creative in the kitchen with your child’s birthday cake. 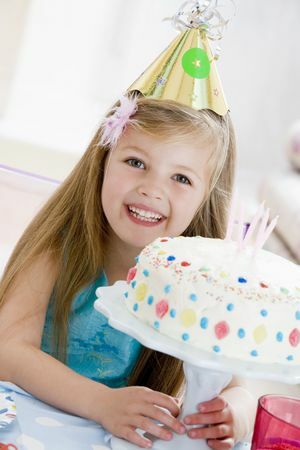 Get into the mind of your child with these easy-to-make birthday cakes; your options are limited only to your imagination! With some boxed cake mix and a few other simple ingredients, you’ll surprise yourself with how inventive you can truly be. Kids love silly monsters and bright colors, and a monster cake combines both of these elements for a successful birthday cake to complement a monster-themed party. To start, bake two to three round cakes to create your monster’s face. Choose your child’s favorite color for the icing (purple, orange, and green make great monster colors). Give the illusion of fur with the back of your spoon, or for more advanced bakers pipe the frosting with the appropriate icing tip. For the facial features, consider utilizing pre-made ingredients such as cake pops for the eyes, licorice for the mouth, ice cream cones for horns, etc. With all of these elements in place, your monster cake will prove a party pleaser! You don’t always need to bake a traditional vanilla or chocolate cake for a birthday party. Does your child and their friends love Rice Krispies treats? This cake will be their new favorite sweet! Simply take the normal ingredients for Rice Krispies treats – marshmallows, butter, and Rice Krispies cereal – and add some cake mix, sprinkles, and crème bouquet (or vanilla extract). First, melt your butter and marshmallows until smooth, and add the cake mix and crème bouquet or vanilla extract. Pour in your cereal and sprinkles and put into a pan to set. Top with frosting or drizzle with chocolate and your birthday party Krispie cake will be the talk of the town. Giddy up, partner! If your child can’t get enough of horses or “My Little Pony,” a pony cake is the perfect choice for a DIY birthday treat. Start off by baking two 9-inch round cakes. After cooling, use one round cake to cut out the shape of a body, and the other to cut out both a tail and head. Combine your three pieces to create a horse-shaped cake. Use your child’s favorite “My Little Pony” character for decoration inspiration, choosing from colors like pink, purple, blue, orange, or yellow. Or, go the more traditional route and pick white, black, or brown colors. Use frosting or candy to create the eyes and hair texture. What would a pony cake be at a pony-themed party without the main attraction: pony rides? Now that you have your birthday cake, make your child’s birthday party extra special by booking pony rides, inflatable bounce houses, and face painting from New Joy Farm Entertainment. No matter the theme of your party, pony rides make memorable moments for children of all ages, and including face painting and bounce houses ensures your event wins party of the year. Contact us today to learn more! What Happens at Pony Parties?